It’s my favorite time of year at Aldi, when the aisles are filled with pumpkins, cider, desserts, candy, and decorations. I enjoy throwing on a cozy sweater and heading out to check out the Special Buys (ALDI Finds) for the season. This is Aldi Reviewer’s running post on fall food products at Aldi this year. Check out our other post on Aldi’s non-food fall products. Come back later for new products and updates. Note that not all of these products will be available all season; check your weekly ad to see what deals will be in your store. Thoughts: This comes in a 52-oz. container. Thoughts: This is sold in Turkey Cranberry or Bourbon Sweet Potato flavors and comes in a 9-oz. package. Thoughts: This 10.5-oz. package comes with four cookies. Thoughts: This 13-oz. package of multigrain cereal comes in Pumpkin Spice or Vanilla flavors. Thoughts: These 16-oz. creamers are made with real milk and cream, and they come in Pumpkin Spice or Maple Pecan flavors. Thoughts: This 16-oz. package of cookie dough is sold in the refrigerated area and comes in Pumpkin Cream Cheese or Apple Oatmeal flavors. Thoughts: This cold pressed cider comes in a 52-oz. container. An Aldi pumpkin next to my hand, to show how big the pumpkins are. Thoughts: This box contains 8 1.58-oz. packets of Pumpkin Pecan Oatmeal. Thoughts: This is a 12-pack with a cost of 59 cents per cup. Flavors include pumpkin pie, salted caramel, coconut caramel, cinnamon hazelnut, apple pie, and cinnamon sticky bun. These can be prepared in Aldi’s Ambiano single serve coffee maker. Thoughts: This is a 12-pack with a cost of 33 cents per cup. These also can be prepared in Aldi’s Ambiano single serve coffee maker. Thoughts: This is 48 ounces, with 150 calories, 5 grams saturated fat, 35 mg of sodium, and 18 grams of sugar per serving. Thoughts: This is sold frozen in a 16-ounce package and comes in Pumpkin Spelt or Butternut Squash varieties. Thoughts: These come in a 13.5-oz. package. Thoughts: These come in a 9.4-oz. package. Thoughts: This comes in Pumpkin Spice or Banana Chocolate Chip flavors in a 16-oz. package. 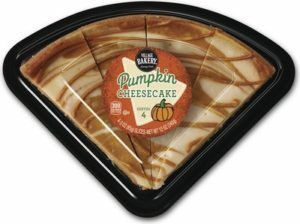 Thoughts: This cheesecake is available in Pumpkin or Apple Cider flavors in a 12-oz. package. Thoughts: This comes in a 14.11-oz. package. We have not sample the pumpkin brioche yet, but we have eaten Aldi’s Regular Buy brioche, which is excellent. Thoughts: These come in a 14-oz. package. While we haven’t sampled these fall-flavored cookies, we generally like Aldi’s Regular Buy Village Bakery cookies. Cost: $1.69 for 5.5 oz. Thoughts: The package says to add cream cheese and sour cream to create a dip for graham crackers or other treats. Thoughts: One package contains 10 single-serve pouches. Thoughts: It’s a giant vat of cheese balls that will turn your fingers orange. Great for parties. Thoughts: Comes in a 750-ml. bottle. Thoughts: Package contains 6 12-oz. bottles. 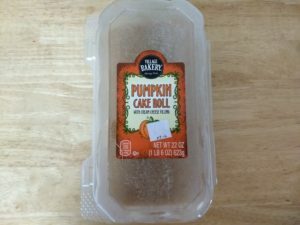 Thoughts: This is one of my family’s favorite fall desserts at Aldi. It consists of moist mild pumpkin-flavored cake with a cream cheese filling. Even if you’re not a big fan of pumpkin-flavored foods, you’ll like this cake. Thoughts: This is one of my family’s favorites each fall. It’s made with just two ingredients: apples and the preservative potassium sorbate. This is significantly less expensive than cider purchased at a traditional grocery store. Thoughts: These hearty donuts come six to a package. They are fine served at room temperature, but I like to warm one in the microwave for about 10 seconds. These donuts have a light coating of cinnamon and other fall-like flavors. Thoughts: This comes in a carton with 6 12-ounce bottles. 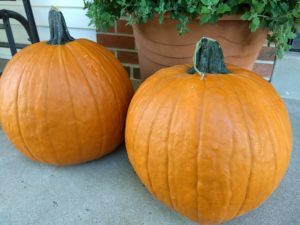 Thoughts: Aldi sells spaghetti squash, acorn squash, and butternut squash every fall. I bought my first spaghetti squash ever last fall and cooked it at home with butter and Parmesan cheese. It was not my family’s favorite vegetable, but I thought it was decent. I couldn’t resist buying spaghetti squash again this year. My spaghetti squash this year has a sticker that says it’s from Frey Farms in Keene, Illinois, which is in the region where I live, so it counts as locally produced squash for me. Cost: $3.79 for 12 oz. Thoughts: This artificially flavored light roast coffee comes in two fall flavors: Caramel or Apple Crisp. Cost: $3.99 for 4.02 oz. Thoughts: This is naturally and artificially flavored 100% Arabica medium roast coffee. It is fair trade certified and comes in Maple or Crème Brûlée flavors. This should work well in Aldi’s version of a Keurig coffee machine. Cost: $1.99 for 12 oz. Thoughts: These are basically pumpkin Cheerios. They’re limited edition with no artificial flavors, no high fructose corn syrup, and no synthetic colors or preservatives. Pumpkin Crispy O’s will net you 12 grams of sugar per 1 1/3 cup serving, so they’re not a low-sugar cereal. They are made with real pumpkin puree and cinnamon, and they taste pretty good. Cost: $2.99 for 7 oz. Thoughts: These delicate cookies come in Apple Cinnamon or Pumpkin Spice flavors. Cost: $3.49 for 7 oz. Thoughts: These are cheeses with fall flavors: Apple Cinnamon, Salted Caramel, or Golden Maple. They’re certainly unique. We haven’t sampled reviewed any of the flavors. Thoughts: The Specially Selected product line often includes gourmet and specialty snacks like this. Cost: $3.89 for 11.7 oz. Thoughts: Kimberley’s Bakeshoppe is not an Aldi-exclusive product. You can read more about this cupcake bakery at this link. This bakery also sells cupcakes at Walmart, Kroger, and other grocery stores. Cost: $1.95 for 11 oz. Thoughts: This is one of the few name-brand items Aldi sometimes sells. Good for your fall baking and for making caramel apples. This same bag sold for $1.98 at Walmart at the time of publication, but Target had the lowest price at $1.89 at the time of publication. Cost: $1.85 for 16 oz. Thoughts: Aldi sells this name-brand brownie mix several times throughout the year, but it’s especially appropriate during the fall. Cost: $2.45 for 15 oz. Thoughts: This is another name-brand item Aldi sometimes sells in the fall. We are suckers for anything Ghirardelli. Alpine, Aunt Maple's, Bake House, Barissimo, Belmont, Friendly Farms, Ghirardelli, Happy Farms, Jacob Einig, Kimberley's, Kraft, Millville, Nature's Nectar, O'Donnells, Priano, Quaker, Season's Choice, Specially Selected, Tumwater, Utz, Village Bakery, Wicked Grove. Bookmark.